Now before I can even start to plug this printer in, I need to be sure that it is safe to power it. The Z400 has been sitting still for half a decade and is already twenty years old. For all I know, a power supply is blown. 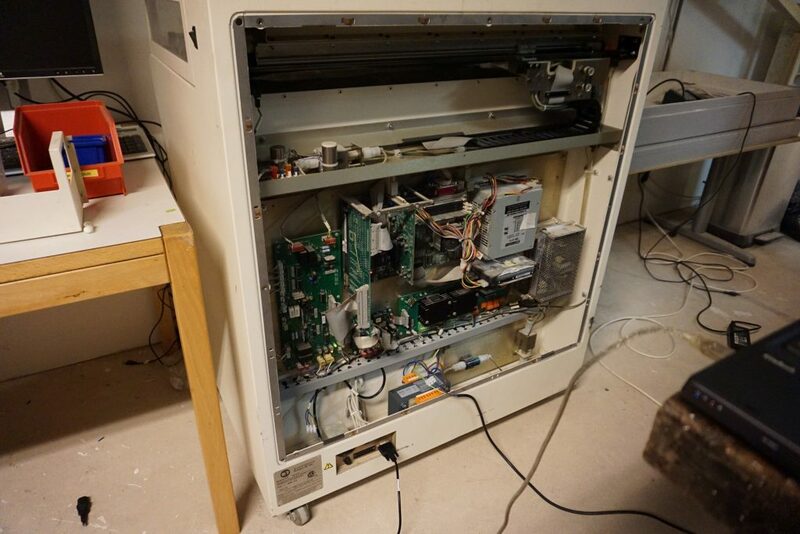 The Z400 is actually a glorified old PC with an inkjet printer attached, and some hardware added to that. It is quite possibly the most amazing hack I have ever seen. 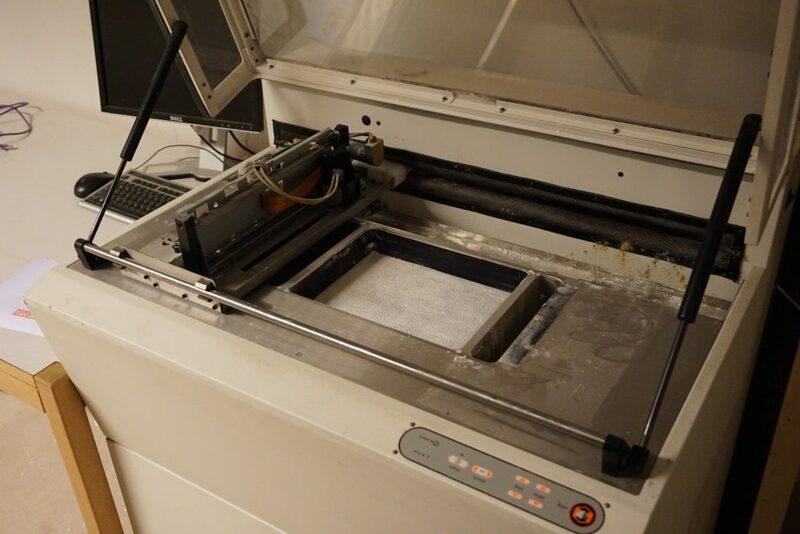 “We want a 3D powder and inkjet printer”, and they just took a real existing inkjet printer (not kidding) and built a whole powder handling machine around this. 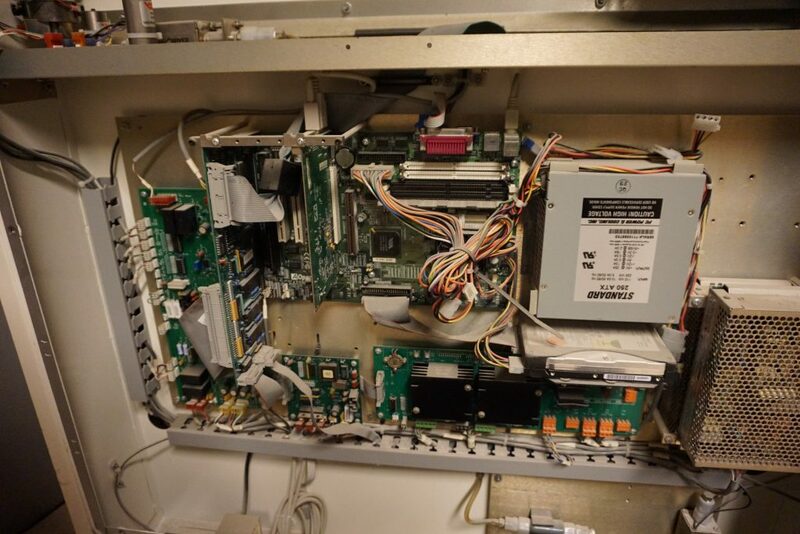 All of this is controlled by a quite normal PC, only with a ISA port to control the actual movement of the machine. It is the way a hacker nowadays would do it, only in this case a million dollar company was founded around it. 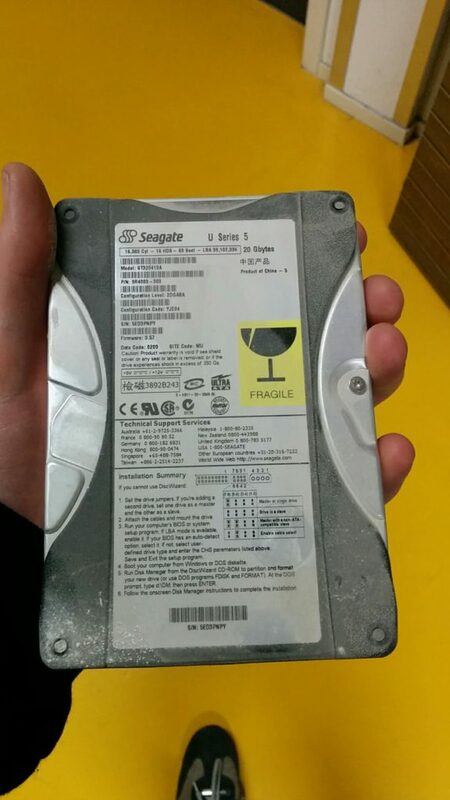 The most fragile and least replaceable part is the hard drive. This holds the DOS OS and some software that controls the Z400. If the hard drive is broken without a backup, I can kiss this whole project goodbye. The hard disc is mounted in the back of the machine. Getting it out is quite simple. Getting an image of the drive was a bit more difficult since it uses an older HDD connector. Luckily the Tkkrlab has a lot of junk, and IDE to USB was quickly found. And the good news, someone had the foresight to replace the HDD (20GB is not normal in late 90s), and the image seems to be good. One worry less. For those interested, I do now have an image of a Z400, if anyone has need for this I can send it. A TL;DR is that it is essentially an image of DOS, with some Zcorp sauce added. Next are the power supplies. These are around the time a boatload of crappy capacitors entered the market, and even without that issue, capacitors don’t live forever. 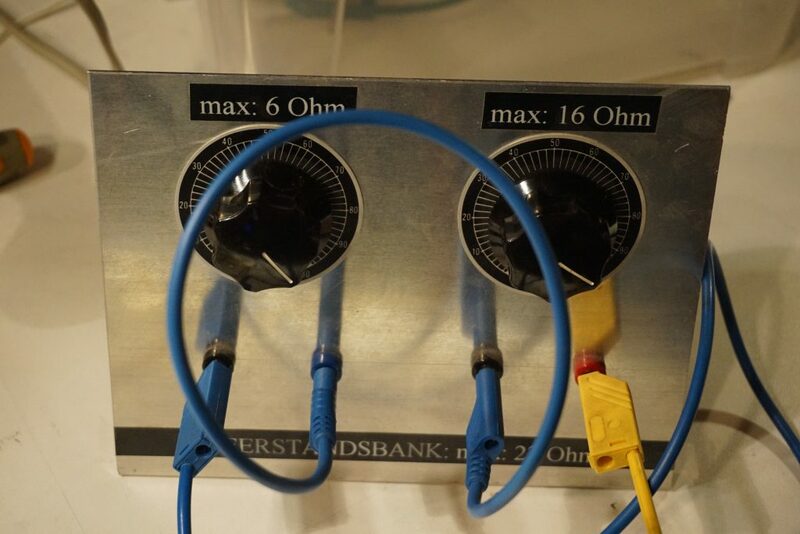 All power supplies (2x 24V and 1x ATX) were removed from the back and separately tested with 115V, the machine voltage. 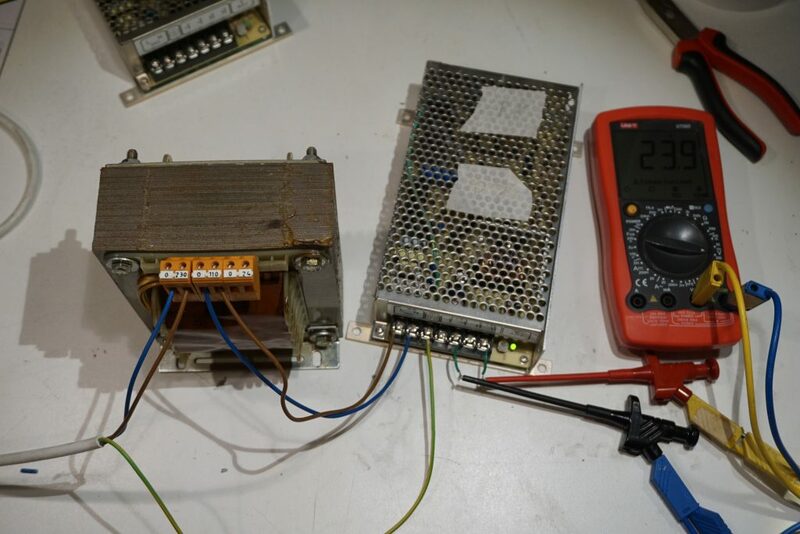 The 2 24V power supplies worked fine under load. The ATX also seemed to be stable, though it was more difficult to test under load. One question remained. How to power this machine. It is an American machine, taking 115V, but I live in the Netherlands, at 230V. 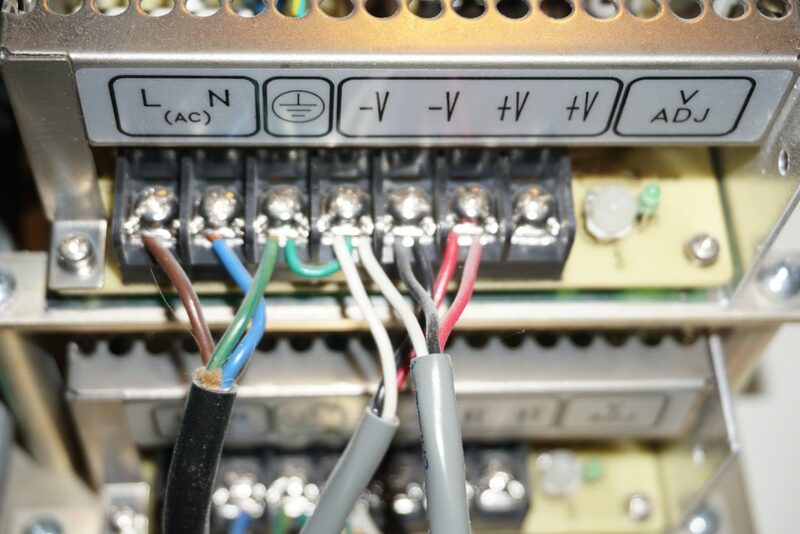 The power supplies can all be switched to 230V, no problem. 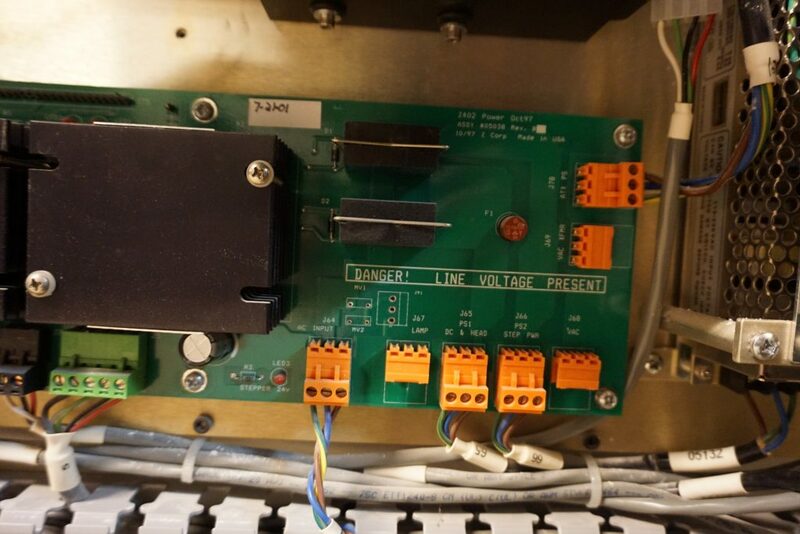 The only issue is that a main board takes the 115V and spreads it to all power supplies. Would I modify the power supplies, or just add a Transformer. An important part of my decision was made with the manual of the Z400. Here it clearly stated that the 115V machine was 136kg, and the 230V machine was 150kg. The only way this is possible is if the 230V machine has a transformer. A 500VA transformer almost perfectly matches this weight. If Zcorp did not bother simply switching the power supplies over, neither will I. It is very possible that a company selling a monopolized machine goes for the simple solution, but I will not take the risk if I do not have to. 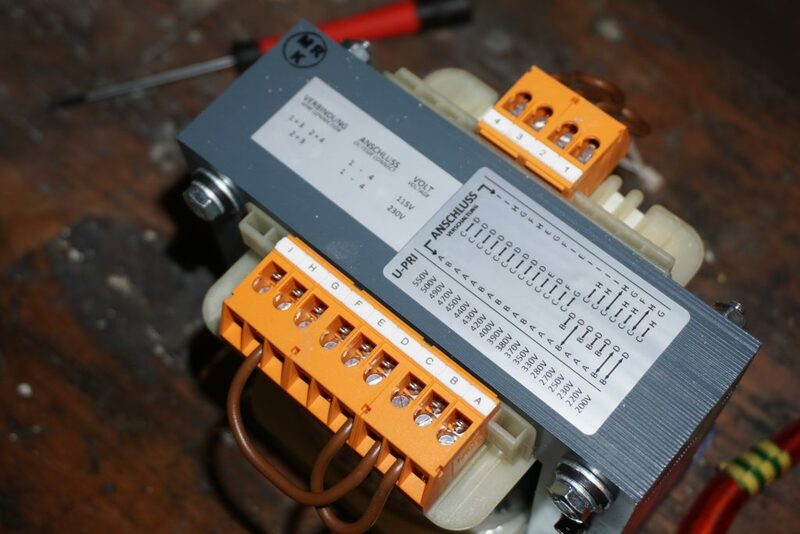 The transformer in question is a nice Riedel 500VA transformer that goes from essentially everything to either 230V or 115V. Exactly what I need. 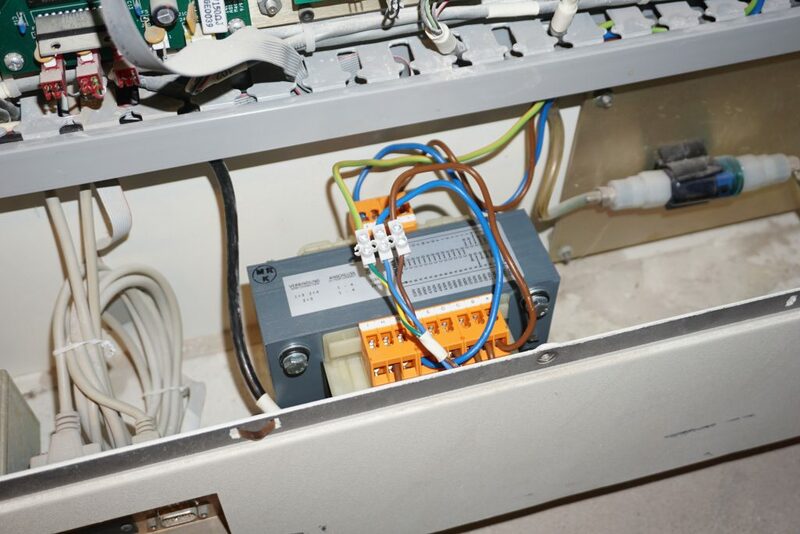 It was mounted in the base, taking the power from the original socket and converting it to 115V before it goes to the main board. There were some flashy accidents with a wire coming loose, and shorting to ground, but other than that, the machine was ready to be turned on. The PC does not seem to boot. When we attach a screen, we see nothing, when we attach a serial port, no response. There is light though, and an image on the HDD. This is where to story ends for today. It was getting late, and any next step would take hours. The first step is to take the ISA card out (it is in the way) and see what type of post codes the machine is sending. We are already looking for an ancient PC with an ISA port as a potential replacement. We have everything we might need to make this work. In the next post I will either have something to work with, or a much bigger project. Hello and welcome to a blog that is a bit different than what I usually do. A repair blog of how I attempt to revive a Zcorp Z400. 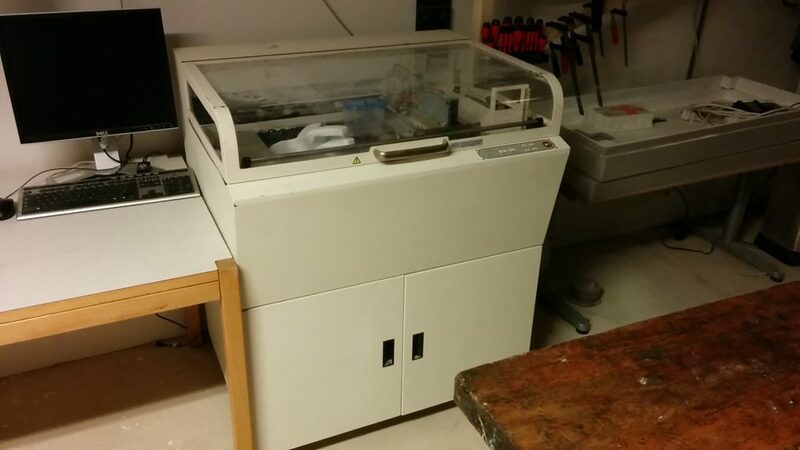 The Zcorp Z400 is a relatively ancient 3DP (powder and inkjet) printer. The manual is copyrighted 1997-2004, so that puts the Z400 at least at 1997. Hilariously enough the user manual completely fails to mention how big the Z400 can print, but it’s probably around the size of an A4 (200x300mm) by 200ish vertical. Once I know, I will say. The BC-20 heads have no DPI known, but should be 128 nozzles since the manual speaks of 128 jets of binder. Again, will say when I know. 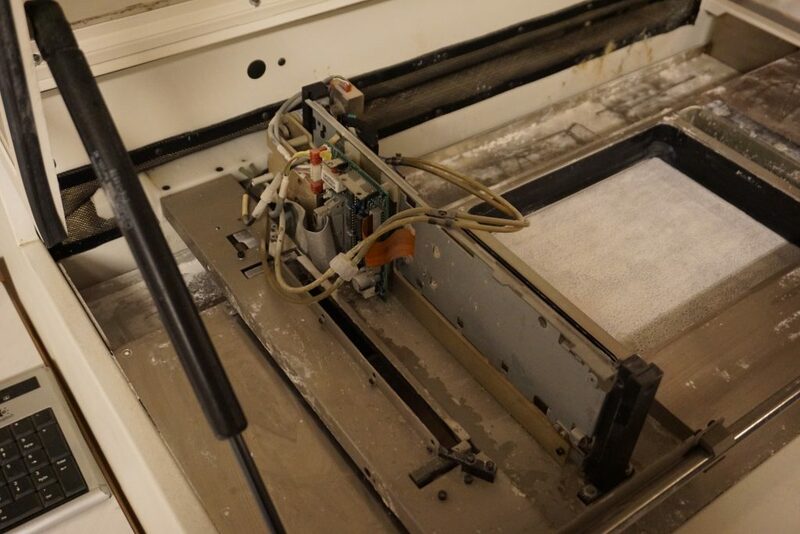 A summary of the Zcorp Z400 is that it is a big standing 3DP printer from the time when 3D printing was unheard of, running an old PC (more on that later) controlled through serial, controlling a hacked Canon inkjet printer to print in powder. There are plenty of motors and pumps and pistons to make it all work, but that is the summary. “But Yvo”, I hear you say, “how did you get this Z400?”. Wonko donated it to me. It has not been running for half a decade and he wanted it somewhere where it might be used. Getting it to my house was quite an adventure, revolving around a too light car, a too big trailer and a town celebrating carnival. It currently sits at the Tkkrlab in Enschede while I repair it. Obviously I want an working 3DP printer from a real original 3DP printer builder. And since there are boatloads of patents involved, there are only 2. Zcorp, and the company that bought Zcorp, 3DSystems. I got into 3DP because I love the concept of 3DP, and my goal is to print ceramics with this. I will investigate other materials, and will continue work on my own 3DP and inkjet adventures, but I also cannot pass the opportunity to get experience with an original printer. The machine has been sitting still for the past few years and is already old by itself. There is no guarantee that this blog will end at page 2 proclaiming the PC as dead and irreparable. But I will try my best to make the original work, and else replace all that is printer with my own electronics. If I did not forget anything, that is what I will need to do before I can start to print. Here is hoping that the machine is still in working order.